As Kronmiller’s project grows, he’s narrowed “robots” down specifically to drones, and has surpassed the level of involvement that many would expect for a senior project assignment. 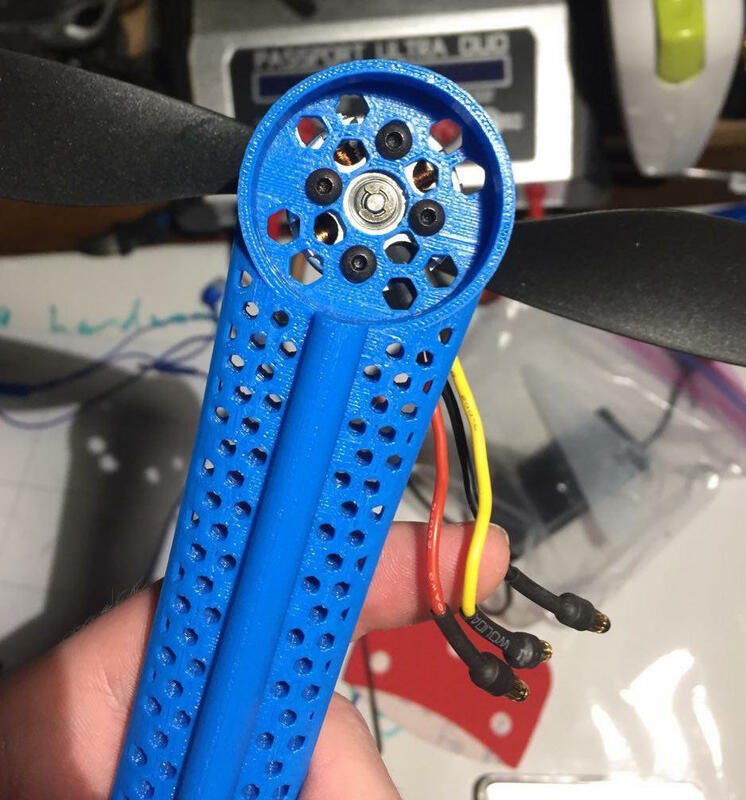 Close up of Kronmiller’s 3D-printed drone arm. Due to the situations for which the drones are needed, Kronmiller has begun customizing his drones. “The Afinia 3D printers have been really helpful for designing the drone and all of its parts,” he says. With his five years of CAD experience, Kronmiller has been able to design the drones for his specific needs. Various iterations show the progression of the main enclosure component. The latest iteration includes rails that allow Kronmiller to attach the flight computer, telemetry, GPS, compass, and Raspberry pi (for camera control and wireless transmission) to the interior for rapid replacement. 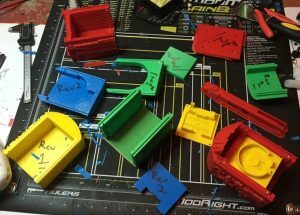 “For example, I’ve used the 3D printers to create a mount for the electronic speed controllers so they don’t just dangle on the side of the drone,” he explains. “It makes it more secure, and easier to swap out parts if something gets damaged. 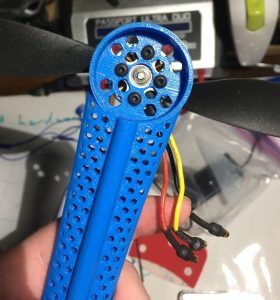 The printer can crank out these parts, small ones especially, in a few hours.” Remember, these drones are being developed to operate in the most hostile natural environments on earth. Kronmiller’s goal is bigger than just creating drones to help with natural disasters. “It’s a two-pronged project,” he says, explaining that he wants to design the search- and-rescue and inspection drones, but also educate students in Nepal about drone technology and inspire them to use it to help their own society. Different iterations of the weatherproofing enclosure for the drone components. Varying colors were used to test for optimum visibility. 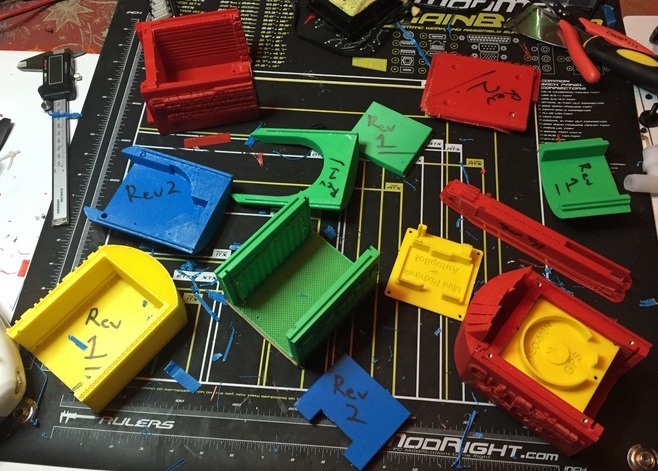 “Ultimately, I’d love to send them a 3D printer, so they can print parts them themselves. If something breaks, they could easily replace it,” Kronmiller explains. “I also want to help get the maker culture growing there.” He has been very successful in his project thus far, and Nepal recently held their first Maker Faire, sponsored by U.S. Embassy in Kathmandu. To keep up to date on the project, you can follow Kronmiller on Twitter, or visit the Nepal Robotics Project blog, Kronmiller and his Nepalese friends update in their limited spare time.